It’s easy to crochet a beautiful, lace “granny” square afghan with this flower-inspired crochet pattern! 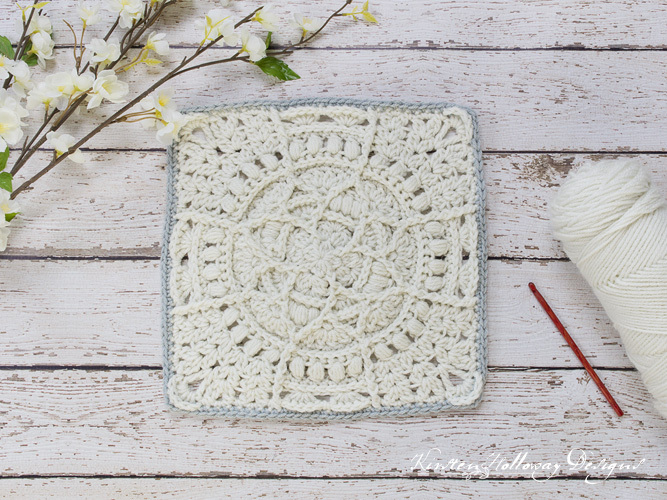 Post stitches create the outline of a Magnolia blossom in the center of the square, while clusters and puffs create a lacy border. This crochet granny square pattern was created for the 2018 afghan CAL over on Moogly. Granny squares can be used to crochet your own unique blanket, and they are quick and easy projects that you can take anywhere in your project bag. 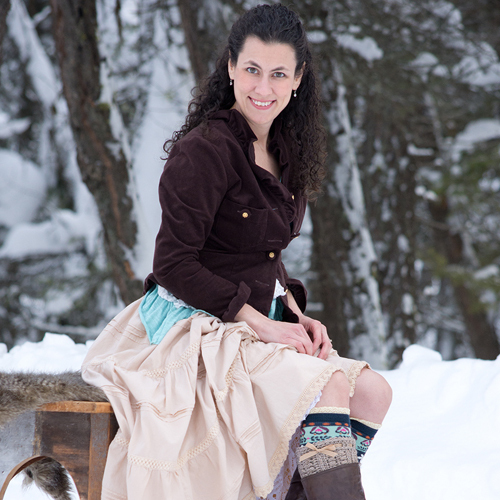 The Magnolia square will give you a warm, but lacy looking afghan when you sew it together, and with a lace boarder it will have a vintage/heirloom feel. 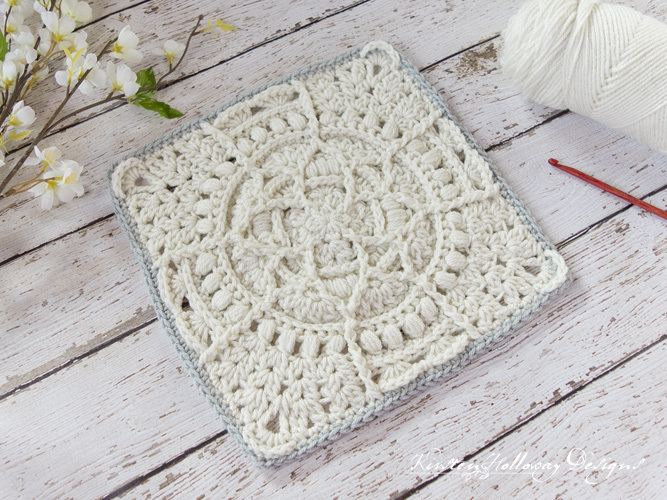 Afghan squares can be joined in many ways, but if you are wanting that romantic, vintage look I’d like to suggest this beautiful Celtic Lace Join, or the Scallop Join. -ch 1 at beginning of round does not count as stitch. All other ch-1’s count as stitches. -Use the FP stitches as a guide to help you keep things lined up. -This square has some cupping issues. Blocking is required to get this square to lay well and show off the lace details. -In rounds 3 and 5 “(FPdc, 3 dc cluster, FPdc) in FPdc” means you’re working around the post AND into the top of the st for the cluster. -If you would like to use this square to create a “granny square” afghan, it’s first helpful to know how large you want the finished afghan to be. If incorporating it into an blanket as part of a CAL the math may already be done for you. If using this block design by itself, here are some rough estimates to help you figure out how many squares you’ll need to make for your project. Since these are 12″ squares you can translate the formulas as follows: For a throw: 5×5= 25. Make 25 squares total. Arrange them in 5 rows vertically and 5 rows horizontally. Keep your chains nice and loose in this next round to minimize cupping. Your piece will probably cup a bit after this round, but we’ll start the process of straightening it out in the next round. This looks gorgeous…but so hard! I would love to see a photo of a finished Afghan. WOW! What a beautiful square!! Pinned. I would love to make this pattern. It is easier for me if I can watch a tutorial. Do you have a tutorial for this granny square? If yes, where can I find it? Such a gorgeous design! I’m just starting to branch out in my crocheting abilities so the written pattern can seem a bit daunting. Would love to see a step by step video I could follow along with since I’m more of a visual learner. But again absolutely gorgeous, great job! Will definitely be subscribing to your blog! I am a complete crochet beginner (and French to boot) but I am up to my sixth square to make the beautiful blanket you made with others for Lorene. I saw it by chance and I thought I had to try and make it, and that I would learn as I went. Thank you : your pattern is really clear and the instructions really helpful. I love your website and I’m having a lot of fun. You will skip those stitches entirely. 🙂 Good luck on the rest of the square!